This light-weight, raglan, pull-over hoody, features custom retro-style artwork of the iconic Cliff Palace. Cozy and comfortable this hoody makes for the perfect layer. Made from a 60/40 cotton/polyester blend. Designed and printed in the USA. *Due to a shipping error, Wine colored hoodies are currently not available in Small, XL and XXL. We do have stonewashed Charcoal hoodies in S, M, L, XL and XXL. If you would like a charcoal hoody please select your size in the Wine color and note "CHARCOAL" in the comment section during check out. An extremely soft and flexible layer, this ¼ zip, moisture-wicking jacket, made from a 90/10 poly/spandex blend, provides year-round comfort. Featuring an embroidered black-on-white olla surrounded by the words “World Cultural Heritage Site” in yellow. Design attributes include; a tag-free label, chin guard on the cadet collar, taped neck, raglan sleeves, with open cuffs and hem. 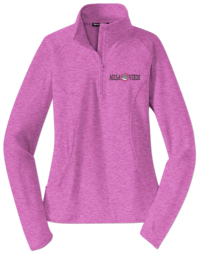 Providing an extremely soft and flexible layer, this ¼ zip, moisture-wicking jacket, made from a 90/10 poly/spandex blend, provides year-round comfort. Featuring an embroidered black-on-white olla surrounded by the words “World Cultural Heritage Site” in turqoise (shown here in red). Enjoyable design attributes include; a tag-free label, chin guard on the cadet collar, taped neck, thumb holes at the end of raglan sleeves, with open cuffs and hem. The gently contoured silhouette provides a fashionable and subtle feminine touch.